In Roman Oxyrhynchus, literature, painting, and the plastic arts go hand in hand. 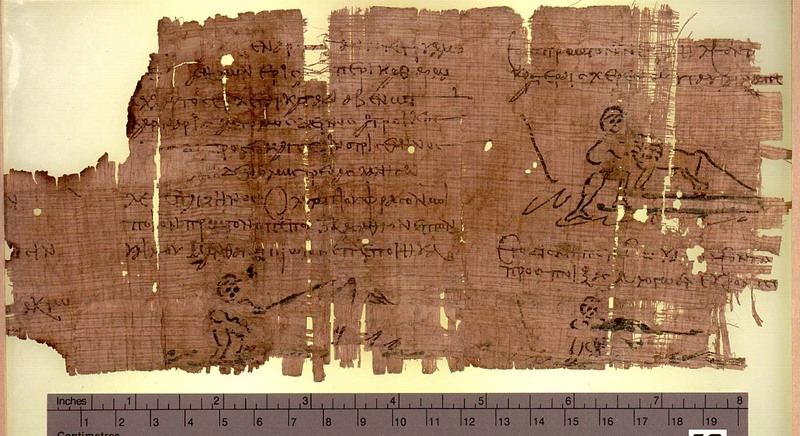 This papyrus contains popular verses executed carefully in a good cursive, interspersed with coloured line-drawings illustrating the lively content: Labours of Heracles. 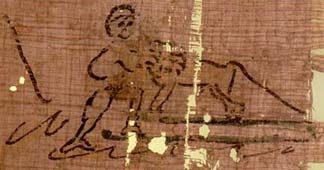 Narrated and illustrated is the killing of the Nemean Lion, the first labour (protos athlos), source of Heracles trademark skin. So the fragment probably comes from the beginning of the roll. In the second of the three scenes Heracles is depicted as naked, strangling the tawny lion by pressing its head under his armpit. His club is coloured yellow, but it seems to lean against something invisible; the identity of the object over the club is a puzzle. The lion stands on higher, green-coloured ground. The other two scenes are equally mysterious: the third very probably shows Heracles holding the lion skin (coloured green) in his strong arms, with legs and tail dangling.